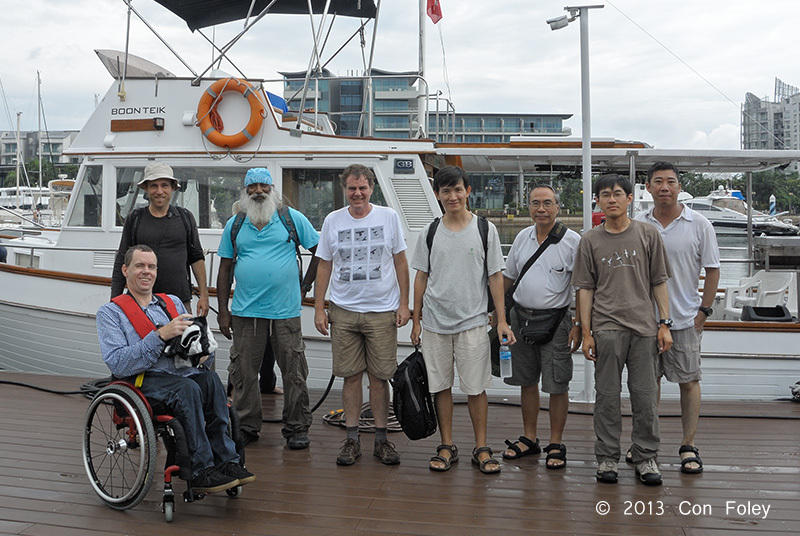 This trip was actually instigated by a birder from Japan, Hiroyuki Shimizu. He had been following our exploits for over a year, and keenly wanted to see Swinhoe’s Storm Petrels. 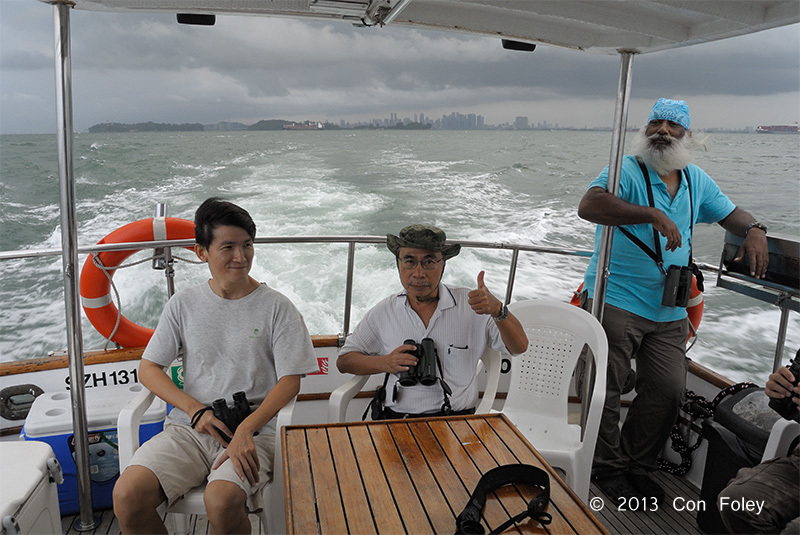 So finally he booked a boat for this date, flew down from Japan, and we joined him for this outing. We were off to a cloudy start, but we hoped for improvement as the day went on, as the forecast was pretty good. 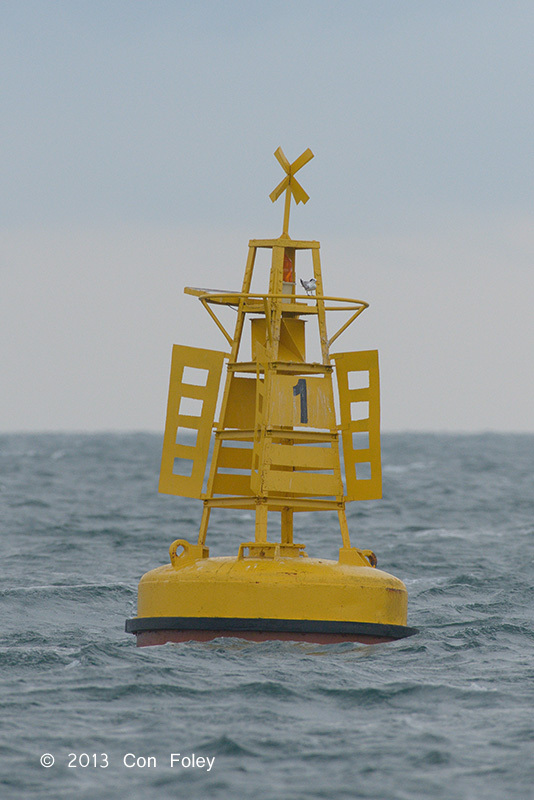 But the birds apparently knew what was coming better than the weatherman did, at our usually productive cable buoy there was only one Lesser Crested Tern. But we had been seeing a smattering of petrels on the fall migration towards the Indian Ocean. Here’s an underside view of a Swinhoe’s, and a lifer for Hiroyuki. 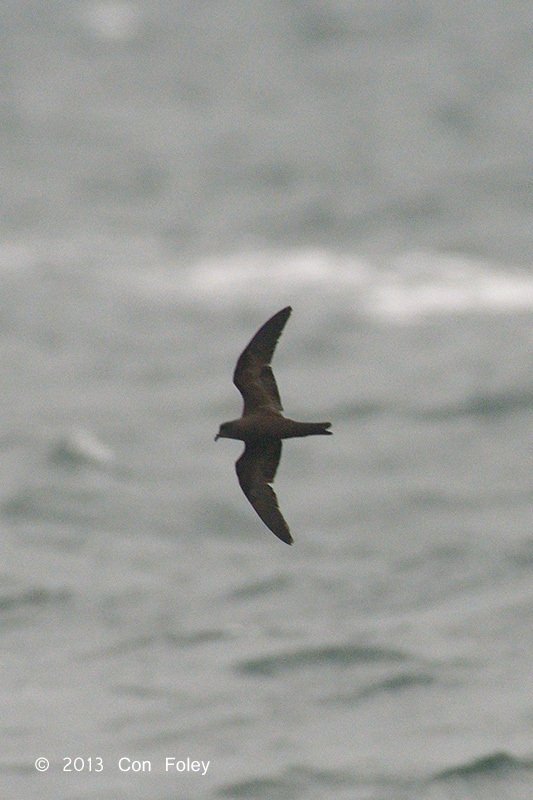 A long way to come for an almost all dark petrel! We saw the same wooden boat with an oversized engine as we saw in July, really moving. 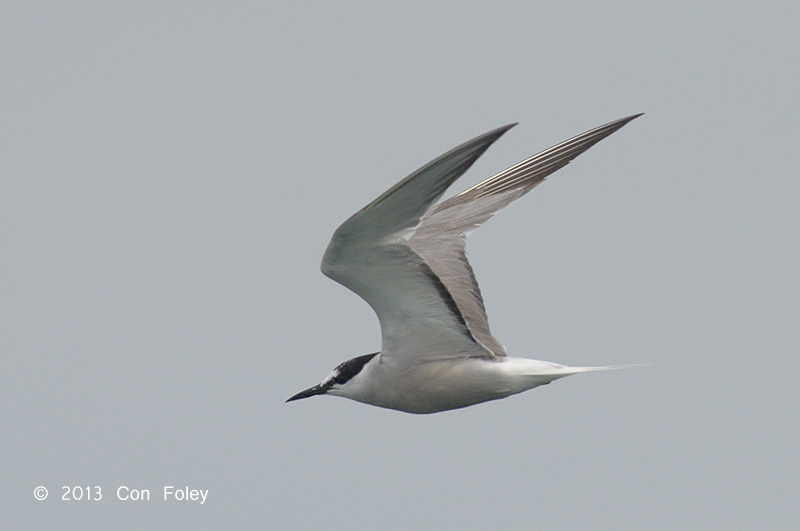 We saw a number of Bridled Terns on their migration in the opposite direction of the petrels. And we started seeing Aleutian Terns on the long distance migration from Alaska to still as yet unknown wintering grounds. 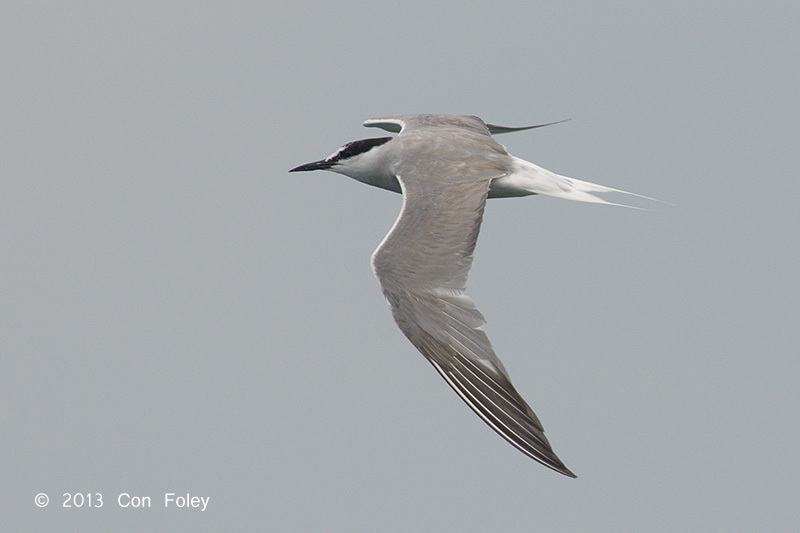 These two photos (above & below) are the same adult Aleutian Tern. 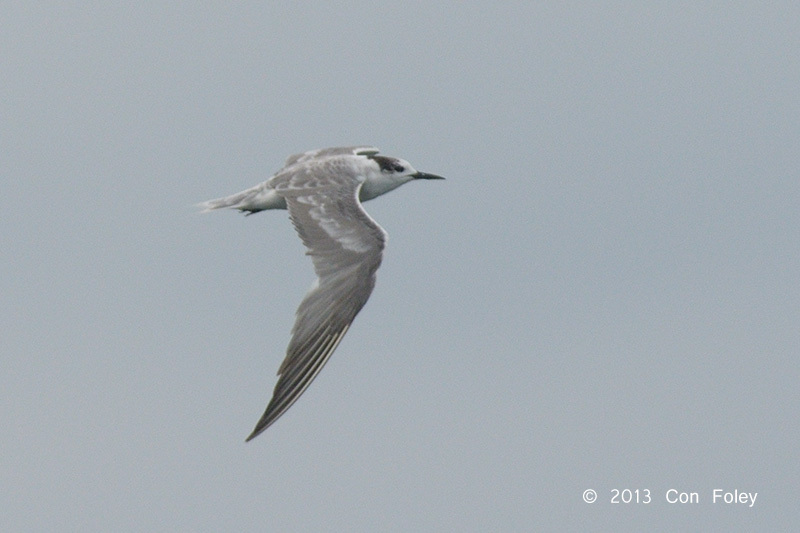 The photo below is a first year or juvenile Aleutian Tern. 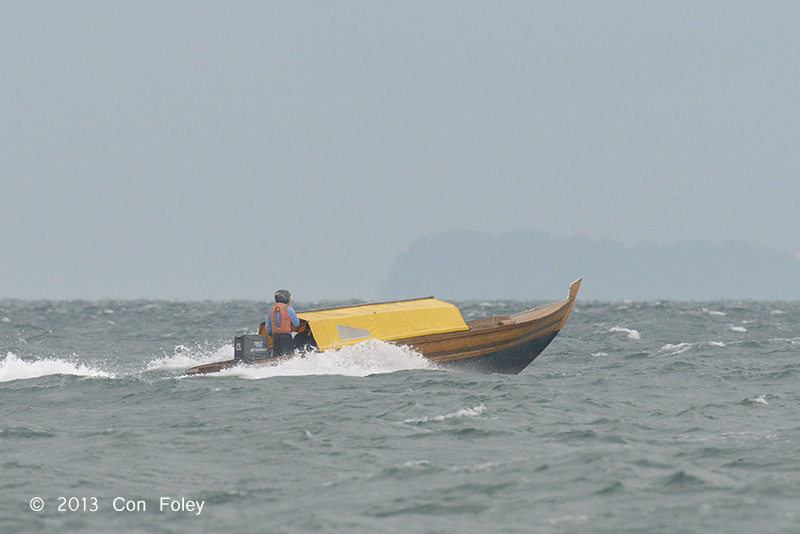 As the bird life wasn’t at a peak, there are always lots of interesting boats in the straits. 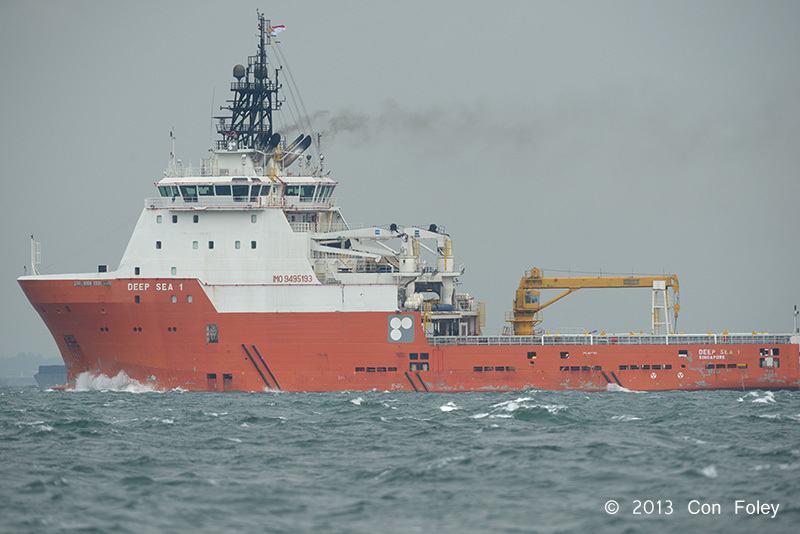 Below is the Deep Sea 1, a class of tug boat that handles the anchors for deep sea oil rigs and tows them to location. Built in Singapore. 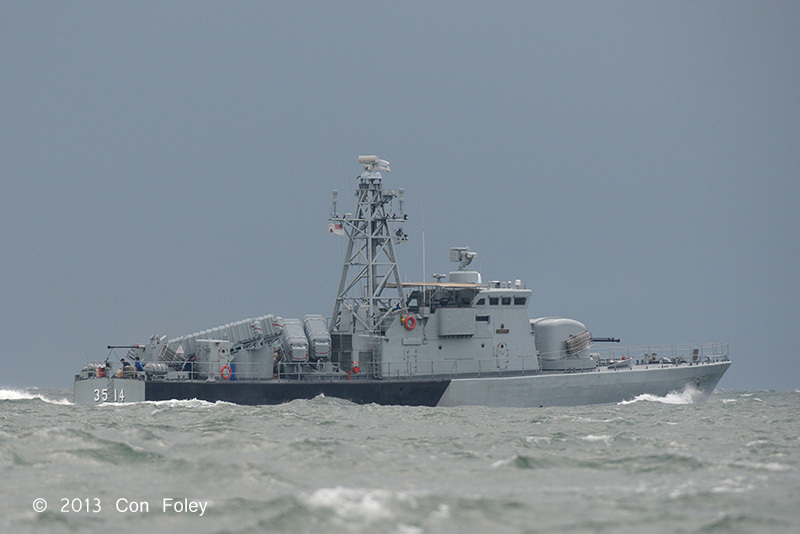 Next up is the Royal Malaysian Navy guided missle patrol boat, Gempita. And a Malaysian customs boat. 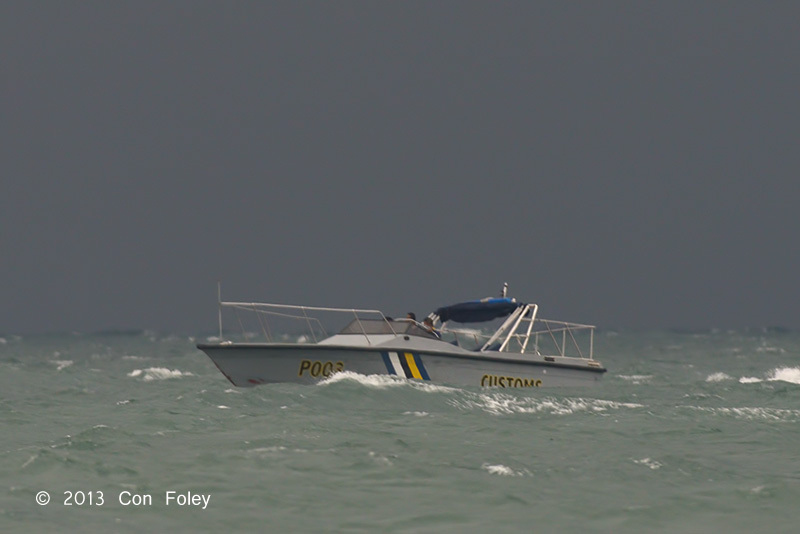 I wonder if he was looking for the fast boat with yellow deck covering above? As you can see the weather is getting pretty threatening. 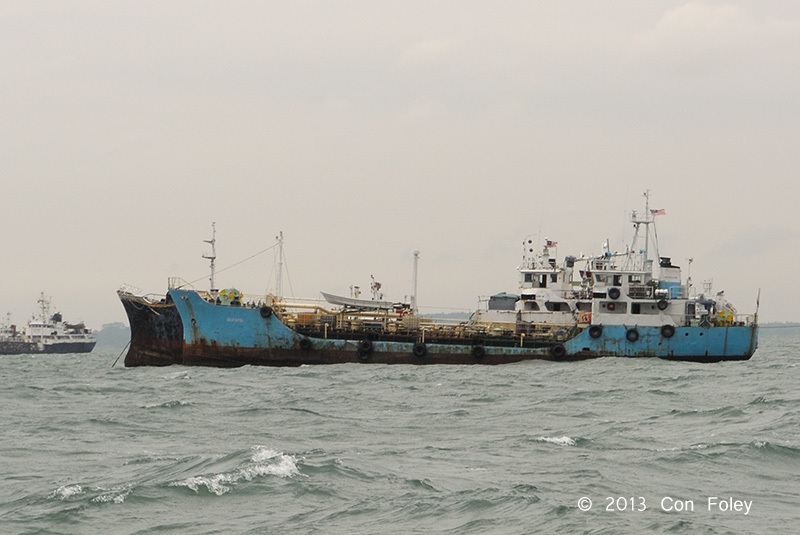 Lots of boats at anchor in Malaysian waters, here are a couple of fixer uppers, all the rust you could ever want. 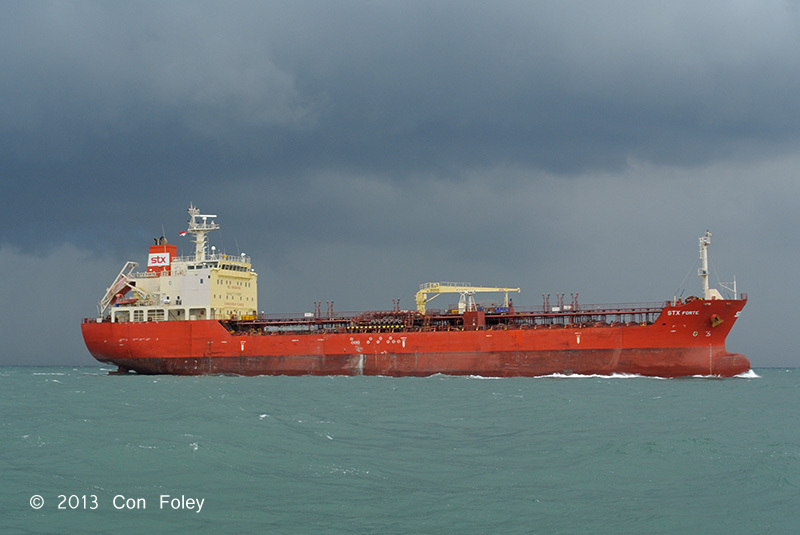 STX Forte is a chemical and oil products tanker, built in 2010, the orange paint is still fresh. From South Korea. And then just after Noon it started raining, heavily at times, and rained all the way back to our berth. 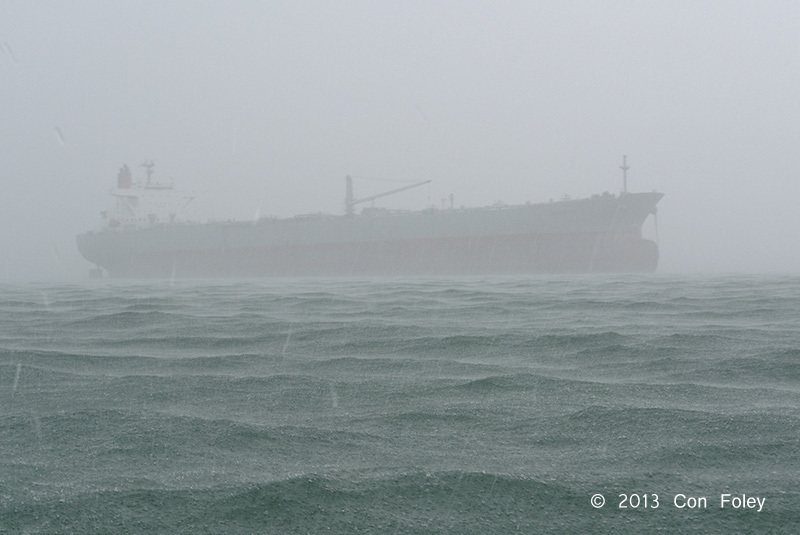 At times the visibility was very limited. Now the weatherman knew it was going to rain today. We got back to Sentosa Cove around 3:00 pm, the rain finally stopped. Here is our rather damp group. Our visitor from Japan is second from the right. Not quite the numbers of petrels we got in Sept 2011 (~500) or Sept 2012 (~500), nor Bridled Terns in Sept 2011 (~600) or Sept 2012 (~300). You’d think “storm-petrels” would love rainy weather. In your text you say the Aleutian Tern wintering grounds are still unknown. This is mega news in Australia as this is the first time they have been seen here. Lots of people are trying to figure out if this is a new phenomenon or if they have been overlooked.